Do you suffer from back pain? Long hours hunched over keyboards and phones, and long commutes mean back pain is a real problem for a lot of us. I have two pain points: the upper back and shoulders, and mid way down my back. The former is because of my job as a copywriter, hunching over a keyboard for hours on end. The latter is because I damaged a disc or two about six years ago when lifting and twisting Ava into the car sea and over the sides of the cot. Now, years later, it occasionally ‘goes’ with no warning, meaning I can’t move for several hours. Far from ideal and absolute agony! I’ve had a course of physio but it didn’t really do anything. I’ve been going to Yoga and Pilates since joining the gym and that has helped, but it still hurts a lot of the time. Over Christmas, we visited my brother in law and I had a turn on his new massage chair. It was bliss. When Naipo Care offered to send some of their massagers to see if they’d help ease my back pain, I couldn’t wait! Naipo sent me the Naipo Neck and Back Massager with Heat, which is currently £21.99 reduced from £39.99 on Amazon*. It’s a compact size but gives a really strong massage. It comes with a normal wall cable and a car charger. Of course you can’t use it when you are driving, but it will be amazing as a passenger on a long journey! 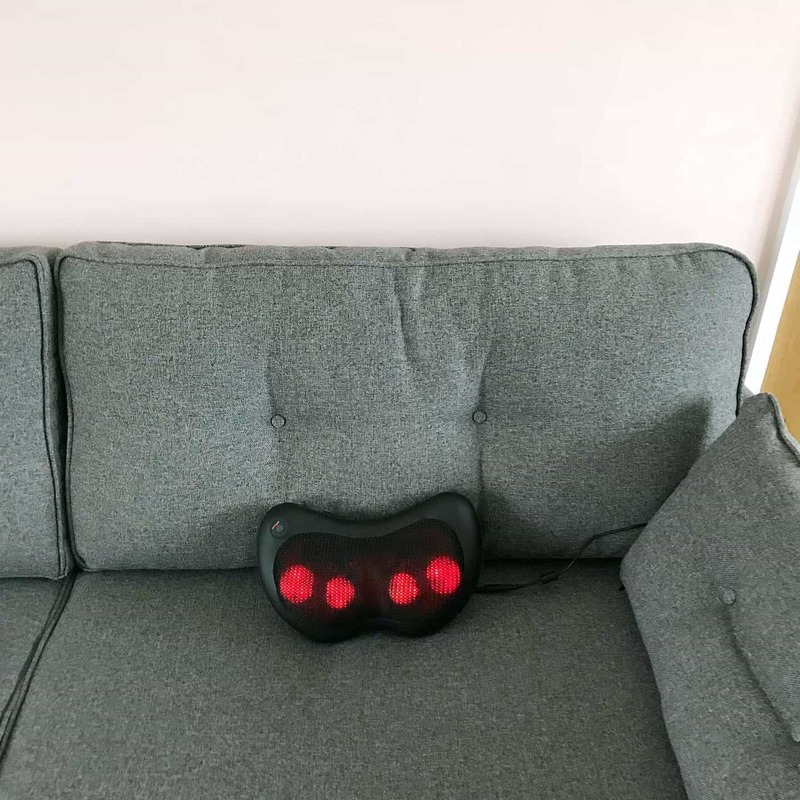 The massager has four shiatsu-style massaging nodes which rotate in two directions. You can use it on your neck, anywhere along your back, on a shoulder, thigh, calf or foot, wherever you like really! Should you have any problems, there is a 24 month warranty. One of the best features, as someone who is always cold, is that the massaging nodules heat up! Not to a crazy temperature, just warm. It’s lovely. You can have it without heat, in which case the massagers are black instead of red. I was also sent the Naipo Shiatsu Cordless Massage Cushion, which is currently £44.99 reduced from £99.99 on Amazon*. 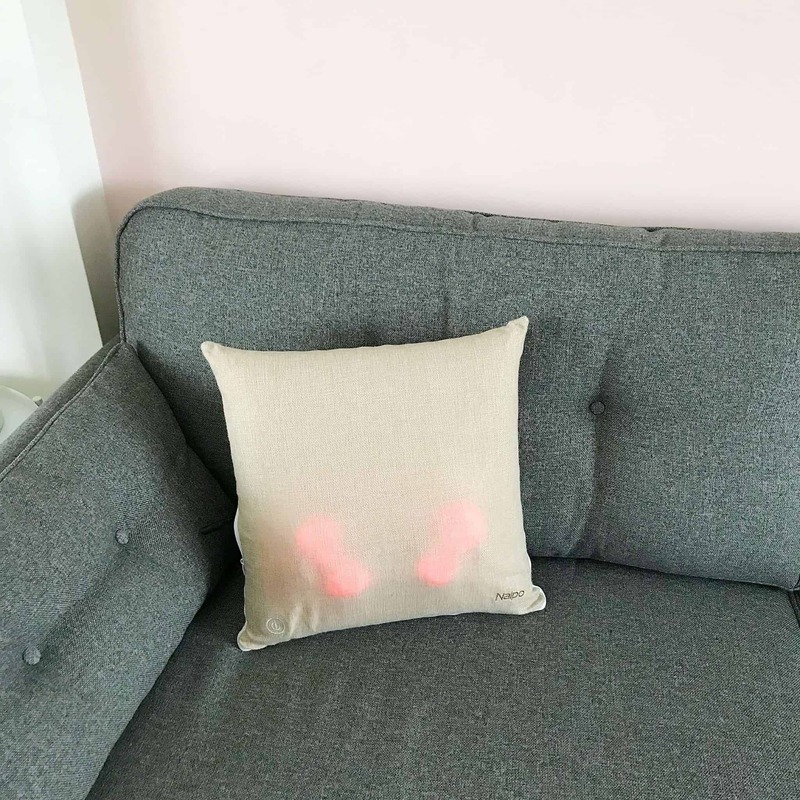 Its the size of a normal cushion but has massage nodules within it. You can use it when it’s plugged in, either with the wall plug or the car charger. Once it’s charged, you can unplug it and it still works (though not for long, in my experience.) You can also use this anywhere you like, but because it’s bigger, I found it works best on the back and feet, as it’s harder to get it into position for smaller areas. 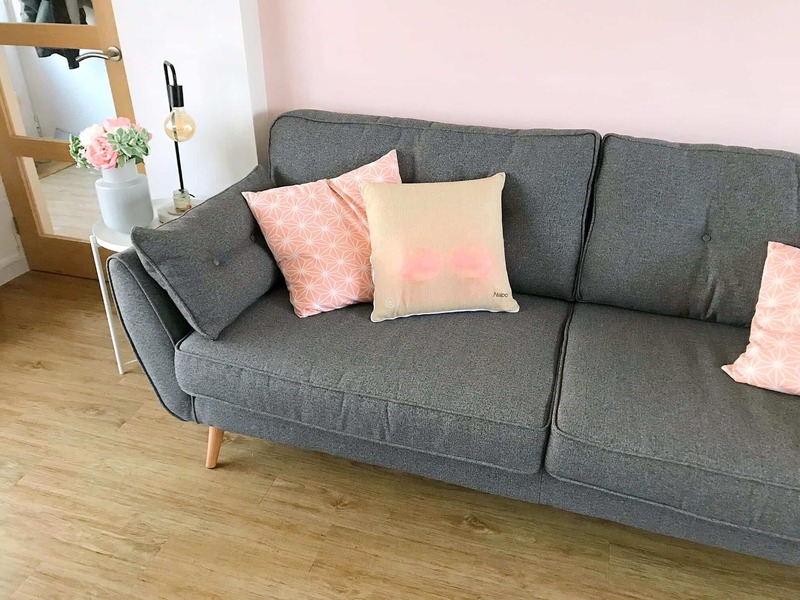 Because the cushion is covered in a beige linen-look material, it blends in pretty well on the sofa. It’s pretty hard though; you wouldn’t want to lean on it instead of a normal cushion, if it wasn’t giving you a massage! 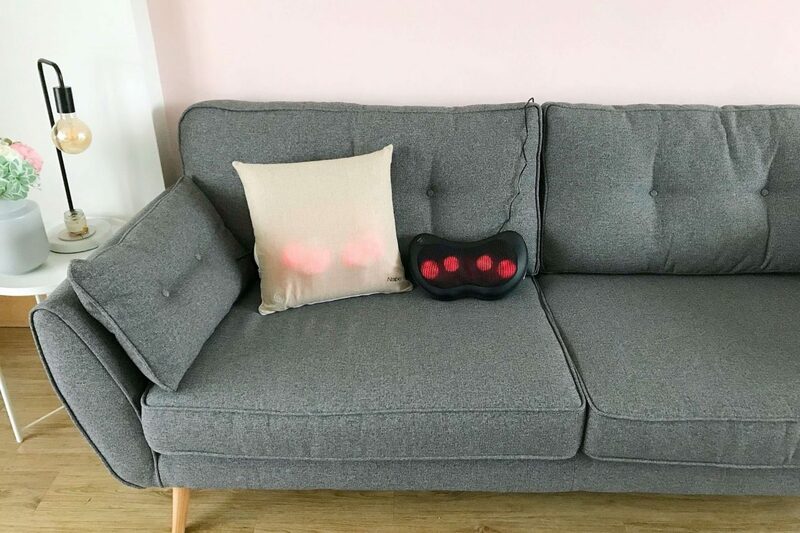 I attempted to add one of my pink cushion covers over the top of the beige one, but although they are the same size, the massage cushion is a lot deeper, so it doesn’t fit. Each of the massagers shuts off after about 20 minutes for safety reasons, but you can just switch them back on. They are both pretty quiet, giving out just a low whirring sound, so I’ve been using them whilst watching TV with no problem. Do These Massagers Ease Back Pain? After using these massagers most nights for a few weeks, I can say they do help ease back pain. The first time I used them I overdid it and bruised my skin a bit, but it was worth it, it feels heavenly! They do give a strong massage but if you put a folded towel in between the massager and your body it would help, if you find it too strong. Alternatively, just don’t lean on it as hard. I like the way you can self adjust it to get the right strength for you. Because I carry tension in my shoulders, which contributes to the headaches I suffer from most of the time, I tried the massagers on my shoulders. Unfortunately I haven’t noticed much difference in my headaches, but that may be because they are more bony so I can’t take the pressure as much! I will certainly continue using them though, as they do help my back pain, and also ease aching muscles after the gym. Although they are both great, I would recommend the black back massager most. It works better for me as it’s easier to control where the massaging nodules go. If you have back pain, I’d recommend giving one of these a try. It won’t cure it, of course, but it might just help you manage the pain! Please note this is not a medical device and I am no doctor! This massager is great for helping manage pain, but won’t cure it! Sounds heavenly!!! My back is aching at mo with too much time at computer i think! 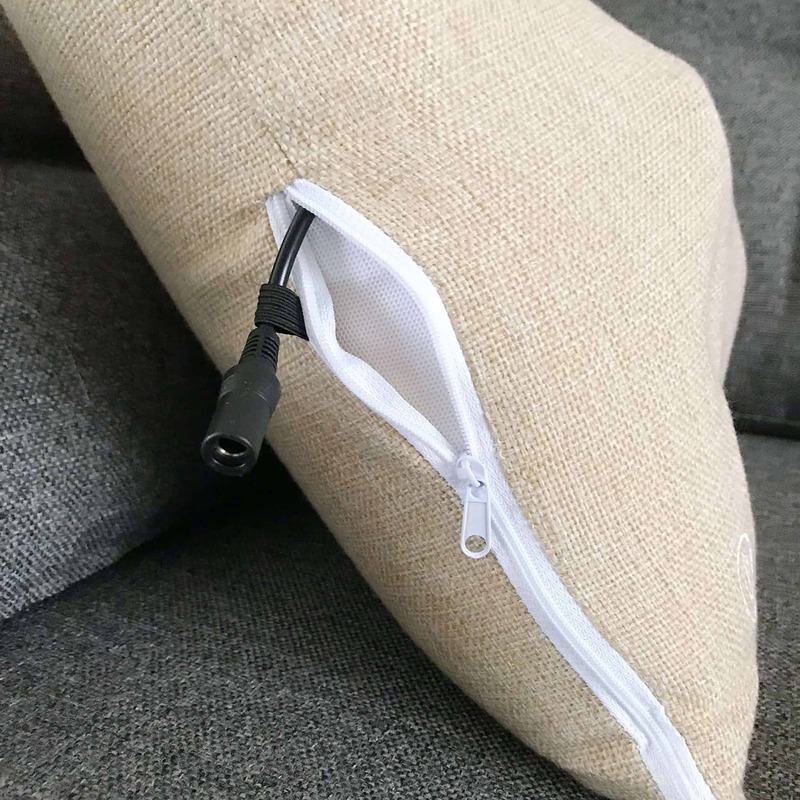 I never thought of putting them inside a cushion! What a fab idea. I have one for my back pain and it would make it so much comfier. Thanks! Since having my son recently, my back has been playing up so these look like a great way to get some relief. My dad has one of these and I always request that he gets it out when I go round there they can be so therapeutic for back troubles! Oh I need one of these- I have terrible back pain! Love that shot of you with your feet – need that in my life! Oh wow this looks amazing, im on my feet all day with the kids then sit hunched over at the desk with work until bedtime so i could really do with something like this! Oh my life my hubby would use this every day for his back and I would use it for my feet! That sounds like bliss actually. My shoulders are also tight and sore by evening and some mornings I wake with a stiff neck – this would be heaven. It’s really quite subtle too with it being a cushion, you wouldn’t feel a bit daft sat there with everyone else watching TV. That sounds heavenly! I think I need one!! Wow – we need one of those, OH hurt his back getting something out of the car boot, and has been in man-pain ever since!